Formerly known as the 'Tiger Bay' restaurant, this is the smaller of two oriental restaurants situated in Cardiff Bay. Located just around the corner from its main competitor (Pearl of The Orient) this restaurant is not quite as grand a venue, but the food is equally tasty. 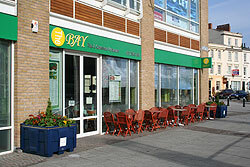 The Bay restaurant occupies a large unit towards the rear of Mermaid Quay, right alongside Roald Dahls Plass. With the opening of the Wales Millennium Centre later this year, The Bay restaurant will be ideally placed (directly opposite) for those pre and post show dinners. Although it doesn't command as spectacular a view as other restaurants in Cardiff Bay, it does have the advantage that you can generally get a table at late notice when everywhere else is full to bursting point. The Bay is primarily a Thai restaurant but there are a whole host of oriental favourites on the menu. The range of set meals is extensive and includes a couple of 'Chef specials'. During the afternoon diners can enjoy fixed price lunches that appear to be excellent value for money. As you dine a pianist plays contemporary tunes in the background to create a very nice atmosphere.